Lake Hillier enchants us with its water of pink colour. It locates at just a next to the Pacific Ocean, hence if we watch it from the way of the sky, the contrast of the lake is in the colour of mellow pink and at the same time the blue colour of the Pacific ocean is mesmerizing. 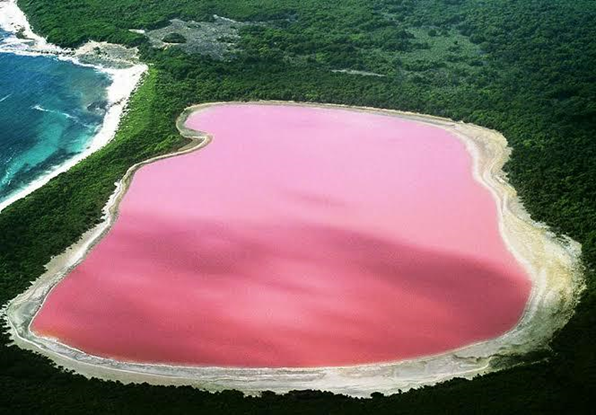 The lake Hillier, which has the length of 600 meters and the width of 250 meters, With surroundings of the eucalyptus and the paperback trees in Western Australia is one of the best tourist magnificent place. Lake Hillier is not only famous for its impressive pink coloured water and its size, but also for a number of diverse fishes which have inhabited in it. The lake Hillier was discovered first in 1802 by Matthew Flinders, who was a navigator and cartographer. He took the water samples from this lake and also mentioned about its existence in one of his journals. The reason for the pink colour of this lake water is still a doubtful topic, that the scientists do not declare an exact reason for it, however, most scientists suspect that the lake consists of the presence of microalgae of the Dunaliella Salina. This microalgae produces carotenoids which is a colour pigment often found in carrots, so the water appears in the pink colour. But another theory is that the presence of a bacteria named as Halophilic in the salt crusts make a chemical reaction in between the salt and the sodium bicarbonate as a result the water turns into the colour of pink. The water in this lake is safe to swim.